I spent my high school years living on the Inner Hebridean island of Islay. My school bus-route skirted the shores of Lochindaal - a magnificent sea loch which is home to thousands of barnacle geese in the winter. The journey would take about 45 minutes. Of course the nearer I got to home the emptier the bus would become and I'd gaze out of the window and let my mind wander. Did she really smile at me today as she got off the bus? Of course not, she's just being polite. Way out of my league. The last few miles of the journey were on single-track roads. That's when I'd transport myself through the window and travel along the wires strung between the telegraph poles. With enough mental effort I could keep up with the bus through a combination of running & speed-skating, jumping when the wires crossed the pylons, surfing when they sloped downwards. It passed the time. Forgive the whimsy, but these memories have been roused by debates I've become embroiled in recently. Let me explain. Think about the average transport cost of getting pupils to school when the communities served are remote and the travel distances long. Think what it costs to build and maintain miles of roads, some of which serve just a handful of people. Think about the telegraph line and power cable cost-per-person when delivering these vital services to remote areas. With islands of course you have the added costs of sub-sea interconnects for power and telecoms, you have ferry subsidies. One of my summer jobs involved driving the hospital van to take laundry to the mainland, staying overnight and returning with clean laundry and fresh hospital supplies. Break a leg on Islay and the air-ambulance will fly you to Glasgow. These are all illustrative examples of what we mean when we say that Scotland is a high "cost-to-serve" country. We have island communities and remote rural villages, our population density is only 20% as high as England's. It's inevitable that - if we are to come close to delivering equal service levels - our infrastructure and service costs will be higher on a per person basis than the rest of the UK. As I've shown elsewhere on this blog (> Full Fiscal Autonomy For Dummies), this higher cost-to-serve is the main cause of the potential £7.6bn "black-hole" that Scotland would face if we were to be fiscally autonomous. Actually I don't like the tabloid friendly hyperbole of "black-hole" - let's just say "that would make us £7.6bn worse off". Which is where we come to the dreaded "subsidy" word. Nobody likes to think of themselves as subsidised and island folk are no exception - subsidy is a word laden with negative connotations. So in the context of the devolution debate and with my island upbringing you'll forgive me if I wearily suggest that I've kind of been here before. Those of you who read my blog regularly will be aware that - when debating Scotland's national accounts (GERS) - I have been trenchant in my criticism of those exploiting confusion over how whisky duty revenue should be attributed. Islay is home to 8 active distilleries and it used to be said you couldn't buy a blended whisky in Scotland that didn't contain at least one Islay malt. So it's perhaps not surprising that - normally when complaining about poor road surfaces or frequent power cuts - Ileachs are inclined to mention the amount of whisky duty the island generates on behalf of the Scottish government. I have a confession to make here: as a teenager I never questioned that logic. So I really do understand how compelling that feels as an argument. I get why, in the context of the Scottish independence debate, some grievance seeking nationalists instinctively feel they should be able to claim any UK duty paid on whisky as "ours". I won't waste time here explaining why whisky duty generated from sales of Bowmore whisky in Edinburgh is no more "attributable to Islay" than the duty charged on Scottish whisky sold in a London is "attributable to Scotland" (or indeed the duty on Russian vodka sold in Glasgow is "attributable to Russia"). Duty income is generated by the consumers buying the product (in whatever territory they may be). If you doubt this see the addenda to this post > Sowing The Seeds - it covers the logic and various arguments around attributing consumption taxes in soul-sapping detail. Of course the whisky industry does create huge value, most obviously through direct employment, associated support industries and corporation tax. But if we're to draw the analogy of "Islay is to Scotland what Scotland is to the UK" then all of those sources of value are already correctly attributed in the GERS numbers. But let's not get lost in the technical detail again - this is all a side issue compared to the point I want to make. If you ran the pro-forma national accounts for Islay I imagine they would show that Ileachs would be worse off independent than remaining in Scotland. Does that mean we should accuse Ileachs of being "subsidy junkies"? Is that a sad indictment of Scotland's treatment of the island over the last few hundred years? Of course not. In fact that observation should be a source of celebration, it's an illustration of how well our sharing society works. It costs more to get kids on Islay to school than kids in Glasgow, it costs more to fly someone to hospital than to drive them. But I'm guessing that most Glaswegians don't give that a second thought. The principle that all citizens within our nation should be entitled to a good education and reasonable quality of healthcare is so engrained that it barely needs to be argued for. Within a nation, we don't draw circles around groups of people and say "you're not paying your way". There will always be circles we could draw within a national map that will define net contributors and net beneficiaries. We don't do that because - I hope - it's instinctively the wrong thing to do. 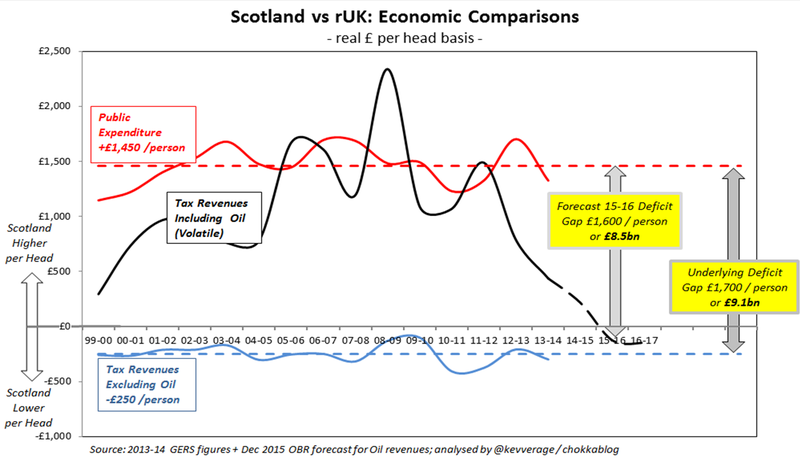 But the devolution debate has been characterised by cries of "it's our oil" on one side (when the oil revenues are high) and "you're subsidy junkies" on the other (when the oil revenues are low). It appears to me that the nationalists have been responsible for framing the debate in these blunt "economic value transfer" terms. So it's rather ironic that - having set out their grievance-stall based on the fact that Scotland contributes more than it get's back - the resultant focus on our finances has demonstrated that in fact the reverse is currently true. Don't get me wrong: I think we should know what the simple financial implications of fiscal autonomy (or indeed independence) are, we should understand our pro-forma stand-alone national accounts. Indeed most of my blogging activity has been taken up by trying to ensure that we are honest with voters about what those numbers show us. But to allow the debate to be couched in these bean-counter's terms, to suggest that the right answer is simply a question of working out which solution makes us richer now (or might make us richer in 10 years' time) is surely wrong. Once you pass a certain threshold of personal comfort and security it is - I hope - a natural and fundamentally decent human trait to want to look out for those who are less well off than you. That's why the welfare state exists, that's why we have the NHS. It's why we have Universal Service Obligations around essential utilities, so that those who live remotely aren't financially penalised. Of course there are pros and cons of throwing your lot in with a wider group. If you don't have sufficient political influence or fiscal control, how exposed are you willing to be to the downsides of others' actions? We'll hear plenty more on this topic during the EU referendum I'm sure. But putting the politics to one side, our willingness to throw our lot in with others - to "pool and share" - is, I suspect, largely dependent on our intuitive sense of likely reciprocation. Which is where we come to the joyously positive example of the United Kingdom and how well it's worked for both Scotland and the rest of the UK. When the windfall gain of North Sea oil appeared in the 1980's it meant that Scotland became a massive net contributor to the UK, we more than paid our way. We shouldn't feel aggrieved that that happened, we should celebrate it. We should no more resent the periods when we contribute than we should be embarrassed by the periods when (like now) we benefit. Over time wherever you draw those circles on a map there's a chance that net beneficiaries may become net contributors and vice-versa. For me that's why - whether we're discussing Scottish independence or EU membership - the objective should be to draw wider more inclusive circles, not smaller more insular ones. Although its importance can easily be over-estimated, it's clear that social media plays an increasingly prominent role in political debate. Twitter has been embraced by many of our leading politicians (in Scotland at least). The obvious advantage of Twitter is that it disintermediates; messages are not parsed by a sometimes unhelpful media but instead pass uneditted from the keypad of the politician to the screen of the reader. @RuthDavidsonMSP I'm sure we could come to some arrangement - @kdugdalemsp? @NicolaSturgeon Oops. Don't tell me I am in the minority. Again. I don't know why this should be the case, but it's hard to imagine equivalent exchanges between prominent male politicians. More's the pity. But of course it's not just about prominent figures taking the opportunity to demonstrate their character and humour. It's possible - in theory at least - to use social media as a way of engaging in substantive debate. It's true that Twitter's 140 character limit forces aphoristic brevity, but in the era of sound-bite politics and short attention spans that's arguably no bad thing. And of course for those keen to delve a little deeper both Twitter and Facebook can act as gateways through to more detailed expositions - the chances are you're reading this blog as the result of a Tweet or a Facebook posting. The performance of politicians when it comes to using Twitter as a forum to engage (as opposed to project) is - in my experience - patchy at best. I've blogged before about the exchanges I've had with SNP MP's George Kerevan, Stewart Stevenson and Michelle Thomson. I'm maybe not best placed to judge, but I don't think any of their reputations were burnished by our interactions. The pattern is usually the same: they say something that's demonstrably untrue or at the very least misleading; I politely ask for clarification; they respond assuming they can bluff their way through; I demonstrate I know what I'm talking about; they go quiet. 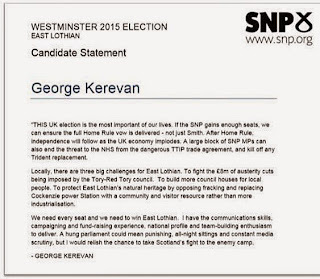 Of course Kerevan and Thomson were both elected to Westminster with landslide margins, so it's clear their interactions with me didn't cause them any lasting harm. At least if politicans are on Twitter they can be swiftly and directly upbraided when they spout nonsense. In the past many of us have shouted at the television in frustration and achieved nothing more than startling our pets; now we can at least share our irritation with a wider audience. Take this recent brief exchange with Angus MacNeil MP (after he attempted to misrepresent a piece of NIESR research). He responded by blocking me immediately, which seemed a little harsh. But when I shared that fact it got widely retweeted. As of today my Twitter analytics tells me the Tweet below has been viewed by over 70,000 people. I'm sure Angus won't be losing any sleep over this, but it is at least more satisfying for me than an impotent rant at the TV. And my dog's slumber was undisturbed; this has to be seen as progress. Aa an aside: Angus Armstrong (a Director of NIESR) did respond to him pointing out that the NIESR hadn't implied what Mr MacNeil suggested. I don't know if Angus blocked him or not. So far so good. These examples all show how social media generally and Twitter specifically can, in a small way, add to the quality of political debate. There's a darker side to all of this of course. I have been asked few times by journalists about the abuse I receive online. My response is generally a shrug. What can sometimes seem like a lot of noise is usually no more than a handful of people. In the context of the volume of voices on Twitter it's frankly irrelevant and it's easy enough to block and move on. But there is something about the burgeoning role of social media that bothers me far more than the trolls, cybernats and other online abusers: social media is an extremely powerful tool for spreading misinformation. There has been plenty written about the role of social media in propogating conspiracy theories. Wikipedia suggests that between 6% and 20% of Americans and possibly 28% of russians believe the manned moon landings were fake. The potential for ludicrous theories or beliefs to gain traction online has not gone unnoticed by the smarter political campaigners and, in my experience, the SNP have been particulary adept at exploiting this. Let's take one simple example that my Twitter timeline is consistently plagued by: the suggestion that the official Governement Expenditure and Revenue Statistics (GERS) are totally flawed (and so can be safely ignored if they demonstrate what some of us would suggest are unfortunate truths). The GERS figures are created by the Scottish Government and underpinned the economic case for Independence - so it is fair to assume that if there is any bias it would be to skew the picture in Scotland's favour. HMRC produce their own figures (Table 4 in this HMRC Document shows methodological differences between HMRC and the Scottish Government) and pages 38 and 39 of GERS show that the differences between HMRC and GERS estimates are are in fact very small. 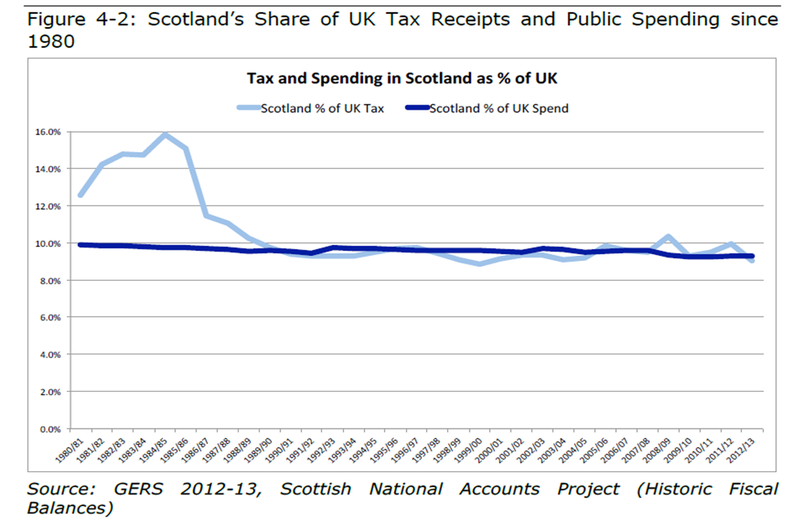 GERS estimate Scottish Tax revenues in 2013-14 to be 0.36%(£181m) higher than HMRC. The likes of Business for Scotland and Wings Over Scotland have made startlingly misinformed statements about VAT and Alcohol Duty that have led some people to doubt the validity of these figures. If BfS and Wings were right it would be a terrifying indictment of the Scottish Government and the official Yes campaign's competence - but of course they are not right; the figures are sound. References to VAT being "paid at companies' headquarters" and Scotland not getting attributed "Alcohol Duty at point of export" demonstrate a fundamental misunderstanding of how these taxes work and how they are attributed in GERS. These are consumption taxes and GERS estimates Scotland's share of these based on consumption data. There is no such thing as "Export Duty" on whisky (in fact you get Export Duty Relief); for the same reason we get to keep tobacco Duty despite not producing cigarettes. A 2 minute search of the official GERS Method Statement is enough to dispel these myths. But browse the comments section of my blog or engage in any GERS numbers based debate on Twitter and you'll see that these untruths are well established in the minds of many voters. How do they become so firmly rooted? You won't (as far as I'm aware) hear any elected MSP suggesting the GERS figures are fundamentally flawed - they would look ridiculous if they did. But you don't have to look too far to see how this misinformation has been seeded online by the SNP's cheerleaders. This is of course simply, demonstrably and unequivocally complete rubbish. Funnily enough the same paragraph appears in a paper from the similarly ludicrous Business for Scotland. They didn't even bother rewording it - it's a direct cut & paste job. That seems to be how the SNP mouthpieces work. So we can see how these falsehoods (and many others) are shamelessly seeded by the SNP's influential social media taskforce. Of course our social media savvy SNP MPs and MSPs do nothing to disabuse their followers of the resulting false perceptions. This stuff takes root. 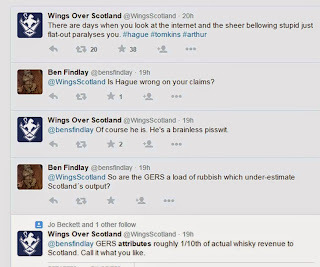 That Wings Over Scotland post was made in November 2013 and is still consistently cited as "proof" that the GERS figures are wrong. Of course the beauty of a blog, of online materials generally, is that if errors are pointed out it's the work of moments to correct them. So either the blog's author (the odious* "Reverend" Stuart Campbell) doesn't realise his mistake or he's happy to perpetuate what he knows to be an untruth. There are plenty more examples I could cite; I'm pretty sure he knows precisely what he's doing. This to me is far more concerning than people like me receiving a few snide, snarky and occasionally downright nasty tweets. Incredibly there has been a storm of people on Twitter (including the Rev himself) defending these ludicrous claims that he's published. Firstly let's be absolutely clear: GERS does not miss out Scottish Revenues - the whole point of GERS is to hypothecate a stand-alone Scotland's finances and it's created by the Scottish Government and was the foundation of the White Paper. Value Added Tax ( VAT) and excise duties are the principal elements of indirect taxation ( i.e. taxes on products) in the UK. VAT is charged on the final consumption of certain goods and services and is levied at 17.5% of the purchase price, though a reduced rate of 5% is levied on some items. Alcohol excise duty is a flat-rate duty on alcoholic beverages while tobacco duty is a combination of flat rate duty and an ad valorem tax charged on cigarettes, cigars and loose tobacco. Any revisions to VAT and excise duties are announced during UK Budget and Pre-Budget ( PBR) reports. Two alternative apportionment methodologies can be applied to VAT and excise duties. Consumption based approach - apportioning VAT and excise duty to the region in which the good was consumed. Production based approach - apportioning VAT and excise duty to the region in which the good was produced. In GERS, VAT and excise duty estimates for Scotland are based on the consumption approach. This is appropriate as the burden of the duty is borne by the final consumer rather than the producer. This is considered best practice as within a system of regional fiscal accounts, the VAT liability 'sticks' when the item is purchased by the final consumer. The location of production is of no relevance. Tobacco and alcohol duties are only collected if the product is consumed in the UK. If the product is exported, the producer receives export relief. For example, while duty is levied on Scotch Whisky when it leaves a bonded warehouse, in reality it is only collected if the whisky is consumed in the UK. Consequently, the ultimate payer of the duty is the UK consumer of the product. Therefore, GERS estimates duty collected from Scotch Whisky based upon the level of whisky consumption in Scotland, even though Scotch Whisky is only produced in Scotland. Similarly, the estimate of tobacco duty collected in Scotland is based upon the level of consumption of tobacco products in Scotland, even though most tobacco goods are produced outside Scotland. So his article that talks about missing Scottish revenues because of excise duties levied at English ports is just wrong. @scotspoond We have no reason to query the HMRC figures. You might think the Reverend would have the sense to back down gracefully - lol. The abuse aside*, it's frankly hilarious that he finishes by attempting to reinforce the belief he's actively propagated - namely that GERS misses a load of revenue that should rightfully be attributed to Scotland. He plays semantics around "export duty" not being mentioned - I quoted him verbatim in my original post and my timeline is littered with people using the phrase "export duty" and linking back to his article as "proof". Billions of pounds of Scottish revenue is magicked away in the official statistics, and doesn’t count as Scottish revenue. It masquerades as revenue from other parts of the UK, most commonly as revenue from London. In total, the extra revenues which don’t currently figure in the GERS stats, but would accrue to an independent Scottish Treasury, would likely be larger than the entire annual income from the North Sea. This article was published in November 2013 - at that time the most recent annual income from the North Sea was £9.7bn. 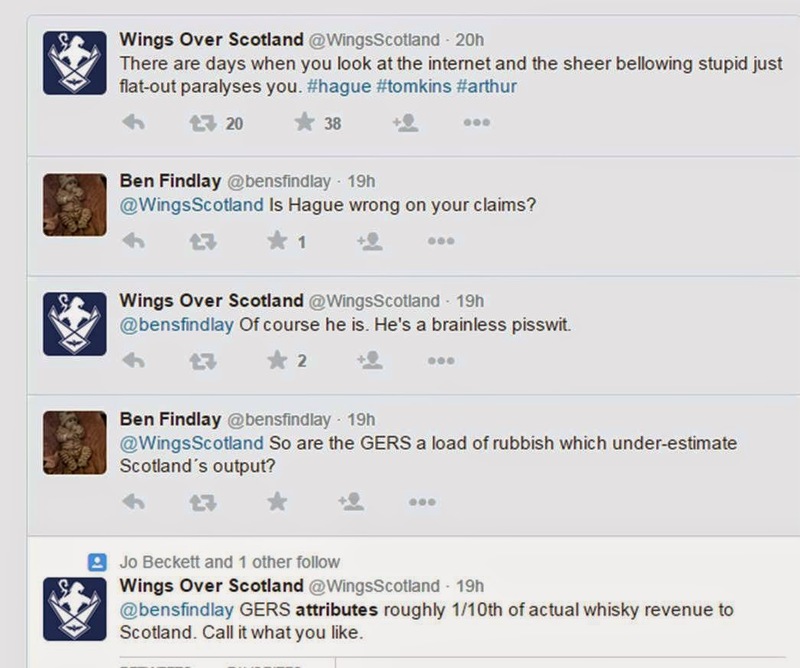 So Wings tells his followers that GERS is missing a figure that "would likely" be £10bn+. He really should be on the phone to the person who takes responsibility for the GERS figures - the Scottish Government's Chief Statistician. "No alcohol duty is levied on Scotch Whisky exported from the UK to the EU or third countries, whether from Scottish ports or from ports elsewhere in the UK. UK alcohol duty (excise duty) is only levied on Scotch Whisky when released from bond for consumption in the UK. Under EU law, the rate of excise duty has to be consistent across the territory of a member state. 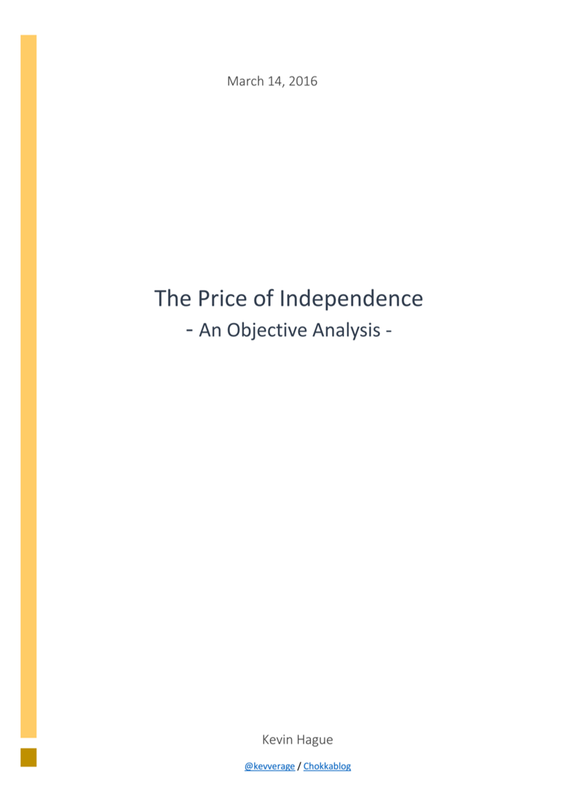 If Scotland were an independent country, the rate of excise duty on Scotch Whisky would be set by a Scottish Government within the parameters for excise duty on alcoholic drinks set by the European Union.The excise duty revenue accruing to a Scottish exchequer would only be the amount raised on the release from bond of Scotch Whisky for consumption in Scotland." The issue of "further powers" for Holyrood was discussed at Bute House on Friday when our Conservative Prime Minister met with our SNP First Minister. This picture is a stark illustration that those who argued "vote SNP and get a Tory government" might just have had a point. Certainly if you buy the argument that Labour's woes in England were exacerbated by Tory warnings about the risks of an SNP influenced Labour government, it's hard not to conclude that the SNP have contributed to the Conservatives' success. No matter; we are where we are. Sturgeon is now able to negotiate on behalf of Scotland with the extraordinary mandate that the Scottish people have given her party. They have 56 of Scotland's 59 MP's at Westminster (in case you hadn't heard). The very fact that the meeting took place in Scotland may have been relevant; was this a conciliatory decision on Cameron's part? Of course he may just have been wary of holding the meeting at Number 10 in case Sturgeon attempted to deliver on her promise to lock him out. What is clear is that the debate about more powers is going to dominate our political discourse for some time to come. I confess to a certain weariness with all of this. We had the referendum, we had the Smith Commission, we've had the general election, we are less than a year away from the next Holyrood election and of course we now have an EU referendum to look forward to. It would be nice to think that somewhere in amongst all of this electioneering, referendum campaigning and constitutional negotiation our politicians would be able to pay some attention to the small matter of running the country. But the drip-drip water-torture of the Nationalists' demands for more powers isn't going to stop anytime soon. They've been at this for a while. I was perusing a rather well-stocked bookshelf the other day and was amused to stumble across this book published by "London Scots Self-Government Committee" nearly 75 years ago. I confess it requires more stamina and patience than I possess not to be at least tempted to consider simply ceding to the SNP's demands for Full Fiscal Autonomy (FFA) - as long as it really is full autonomy, including the removal of any Barnett-style subsidy. "For Scotland to accept fiscal autonomy without inbuilt UK-wide fiscal balancing would be tantamount to economic suicide"
Remember the transparently misleading economic claims made by the SNP during the Independence Referendum? Their declared determination to "kick the last Tory out of Scotland"? In that context it would be understandable if David Cameron adopted the position - voiced by many senior figures in his party - that he should give the Scots the Fiscal Autonomy they appear to have asked for and see how they like it. After all, it would help his desire to implement English Votes for English Laws and be economically beneficial to the rest of the UK. As an aside: the "honest disagreement" wording implies that Sturgeon was in fact arguing for Full Fiscal Autonomy without "fiscal balancing" (because that's where the £7bn comes from). The implication is that she was arguing for what her own economist MP describes as "economic suicide". 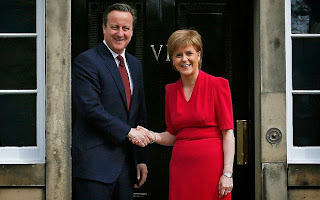 Either we have a kamikaze pilot in control of Scotland's economic destiny or Cameron is playing word-games. What's scary is I find either option equally credible. Whether you think that quote is attributable to Voltaire or Spider-Man's uncle Ben, it has resonance in this debate. The reason why the FFA debate has become so confused is that when the SNP now argue for Full Fiscal Responsibility with "UK-wide fiscal balancing" they are in fact arguing for fiscal power without the associated fiscal responsibility. As long as we continue to share a currency, a central bank and responsibility for our share of the national debt then our economic fates remain interconnected. Given that reality it would clearly be unacceptable for a Fiscally Autonomous Scotland to continually run a higher deficit and to be contributing disproportionately to our national debt. Whether some of that debt is ring-fenced to Scotland is beside the point - if the ability of Scotland to bear its share of the national debt becomes compromised, the cost of that would fall back on the rest of the UK. If Scotland is unable (or unwilling) to control its own affairs such that its deficit is in-line with the rest of the UK (i.e. without the need for balancing fiscal transfers like those Barnett delivers), it is only reasonable that the rest of the UK retains control over the fiscal levers. You can't have the economic power if you don't take the economic responsibility. This is of course why the Yes campaign floundered so badly on the issue of currency; you can't be truly independent and share a currency, you have to adhere to fair fiscal constraints. Ask Greece. So let's move on assuming that FFA is off the table. This means we need to focus our attention on the debate that was reignited by the referendum and progressed through the Smith Commission: what further powers (in addition to Smith) should be devolved to Scotland? To sensibly progress this debate I'd suggest we have to ask not just how any further devolved powers could be used but also how they could be abused. Is there a risk that these powers could be used in a way that might damage the UK as a whole? We have to ask who will be wielding these powers and to what end. "The aims of the party shall be (a) Independence for Scotland [..] (b) the furtherance of all Scottish interests'"
If the Independence Referendum taught us anything it is surely that for the SNP clause (a) trumps clause (b) every time. Nobody can now seriously believe that the SNP were not aware Independence would have made us poorer. Remember that FFA is effectively Independence without the associated independence downsides (most notably currency and potential job losses as businesses who serve the UK from Scotland relocate to avoid exposure to export risk). Even the SNP themselves now tacitly accept - or in Mr Kerevan's case explicitly state - that Scotland's economy is in far worse shape than that we share by being an integral part of the UK. A simpler illustration of this point is a quote that I have heard attributed to a civil servant describing John Swinney's motivation: "You have to remember, John would live in a cave to be free". ".. After Home Rule, independence will follow as the UK economy implodes .."
This is the same Mr Kerevan who the Scotsman recently revealed is the SNP member invited to help "draw up plans for a federal UK". Just think about that for a moment. But it's not just about the potential for what some of us would see as malicious misuse of these devolved powers. After all, if you're one of those who believe the paranoid conspiracy theories about Westminster's vendetta against the Scots, you are just as likely to distrust how those powers are used now. The more subtle point here is that devolved powers may create a situation where rationally self -interested behaviour could still be value destructive for the UK as a whole. Take two of the issues that appear high on the SNP's agenda when they argue that the Smith Commission proposals do not go far enough; the Minimum Wage and Corporation tax. I'm intuitively in favour of raising the minimum wage. We have a problem with in-work-poverty and shifting some of the burden away from the state and on to business doesn't seem unreasonable to me. But as I argued in the Smith Commission submission I contributed to: allowing differential minimum wage levels within the UK would be value destructive. A higher minimum wage in Scotland would damage competitiveness of Scottish businesses and cause some businesses (or entrepreneurs) to move South at the expense of Scottish jobs; a lower minimum wage would be be potentially damaging to social welfare by encouraging a regional low-wage economy. It places an additional reporting burden on UK businesses who would have to report (and audit) Scottish profit separately from rUK profit. Trust me that for many businesses this would be a non-trivial exercise. If the argument in favour of lower regional corporation tax is about attracting international inward investment then you are simply engaging in a race to the bottom. Helping internationally mobile businesses pay less tax seems to me incompatible with the objectives of social justice. There are strong, rational, UK-wide arguments against devolving the ability to set the minimum wage or corporation tax rates. The Smith Commission may have been necessarily rushed but it seems to me they did a pretty good job. They defined a series of further powers and a set of principles that delivered against "The Vow" whilst limiting the risks of these powers causing UK-wide value destruction. Of course they didn't go far enough for the SNP; nothing short of full independence will ever be enough for the SNP. So surely it would be appropriate at this stage to focus on delivering the powers already proposed and seeing how these are actually used before pushing for yet more devolution? Without FFA the SNP may be spared from showing how their "anti-austerity" rhetoric would translate into action if they were actually accountable for the resultant debt ... but with Smith powers they should be able to demonstrate their progressive credentials by redistributing the tax burden. It will be interesting to see how the SNP's popularity survives when they start demanding a little less and are forced to start delivering a little more. Well Salmond's tenuous grasp on economic reality is comprehensively covered in this blog but I hadn't heard much about Mr Kerevan. "Far from being worse off, Scotland would be getting richer at around £500 per person per year on these figures. (By the way, the OBR only gets Scotland’s 2016-17 deficit lower than for the rest of UK by predicating unrealistically low oil prices.)" OK so he was spectacularly wrong about that but he's hardly alone there. "However, IFS is making the political assumption that any Scottish Government spending per capita – above and beyond the UK average – will have to be fully funded from Scottish resources"
The whole independence campaign was run on a "we'd be better off" (and "we'd be getting richer") message from the Yes camp. Anybody who questioned our ability to fund our higher public spending from our own tax revenues was accused of thinking Scotland was "too wee, too poor, too stupid". But now we're told it's ridiculous to assume our spending should be funded purely from our own resources. It's hard to know whether to laugh, cry or turn to drink. Of course this spectacular inconsistency - this tacit admittance that the economic claims made during the indyref were nonsense - mattered not a jot. Nothing could stop the SNP juggernaut as they swept all before them at last week's general election. "After Home Rule, independence will follow as the UK economy implodes [..] I would relish the chance to take Scotland's fight to the enemy camp"
It seems the enemy is "undemocratic Westminster". Right. @holland_tom @GeorgeKerevan Also George: you say you're taking the fight to the "enemy camp" Systems don't live in camps, people do. But fair enough. He's been decent enough to respond and the "enemy" rhetoric is hardly surprising in an internal SNP document. @GeorgeKerevan 1. Shouldn't voting for you *stop* that happening? 2. Maybe reread what your statement actually says? 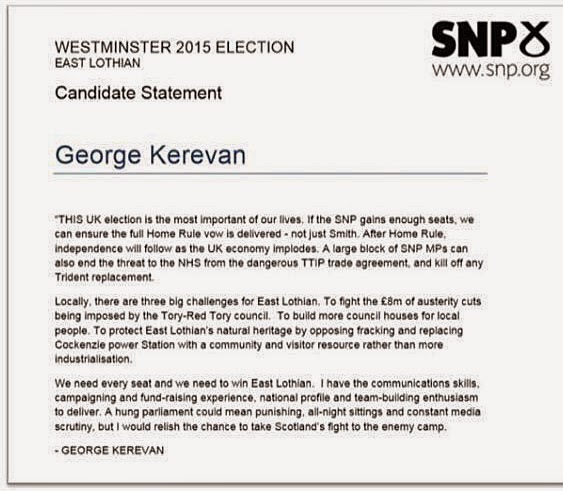 @GeorgeKerevan ... now you say if I vote for you you'll end austerity and prevent the UK economy imploding. Which is it? Needless to say despite a few polite nudges I've never had a response to this question. Too late now I guess, he's my MP anyway. "We all know that in present UK economic circumstances a fiscally autonomous Scotland would face a significant budget deficit. For Scotland to accept fiscal autonomy without inbuilt UK-wide fiscal balancing would be tantamount to economic suicide"
At least he's consistent. Of course during the campaign his more vociferous colleagues were telling us the black-hole was "made up" and nothing to be worried about. During the indyref we were told we send more to Westminster than we get back. Now we're being told that full fiscal autonomy would be "economic suicide" because of our reliance on "UK wide fiscal balancing" to fund our higher spending. I wonder why - in what is a popular newspaper - he uses the phrase "inbuilt UK-wide fiscal balancing" instead of just saying "subsidy" or "pooling and sharing"? Maybe George is afraid that a few SNP voters might notice the staggering hypocrisy in the SNP's position if he spelled it out that clearly. The SNP should be applauded for their remarkable General Election success. Those of us who criticised their campaign rhetoric and felt their economic policies were potentially hugely damaging to Scotland must take pause. What do we learn from this? It turns out that in Scottish politics at least, quite a lot of things don't really matter. The SNP campaigned for independence based on a series of economic claims that were demonstrably misleading at the time and have since been shown to be clearly wrong. If the SNP had won the Independence Referendum we would be starting our independent lives £8bn a year worse off (that's £1,500 for every man, woman and child in Scotland). This is no longer conjecture - it is a fact demonstrable from the Scottish Government's own published figures. So the fact that the economic case they presented for independence has been shown to be nonsense? It doesn't matter. "do not reflect the full wishes of the people of Scotland [..] falls short because it could only go as far as the Westminster parties were prepared to go"
"it is not enough, it doesn’t live up to the vow, it doesn’t deliver a modern form of home rule"
SNP councillors publicly burnt the Smith Report and - after a brief suspension - remained in their posts. Instead the SNP demanded Full Fiscal Autonomy (FFA) - before realising that their rhetoric about "sending more to Westminster than we get back" and oil being "just a bonus" would become rapidly exposed as untrue if we were to keep our own taxes and actually try and fund our own public spending. When the IFS produced analysis showing that FFA would create an immediate £8bn black-hole in Scotland's finances the SNP - after initially dismissing the analysis as being simply "Project Fear" - proceeded to execute a spectacular reverse ferret. They argued "it won't happen anyway" and "by the time it happens all the numbers will be different". With quite breath-taking hypocrisy they even argued "we'd have to also keep the Barnett Formula in place otherwise the Smith Commission principle of no detriment wouldn't be honoured". That's the same Smith Commission report that - in order to achieve the no detriment principle - fell so far short of the SNP's expectations. The same Smith Commission report that they dismissed, ridiculed and set fire to in a dustbin. This is not so much wanting your cake and eating it as saying your'e going on a diet but want to keep stuffing your face with cake. So the fact that the SNP aren't actually prepared for Scotland to economically stand on it's own feet just yet, despite all of their indyref rhetoric? It doesn't matter. The SNP have argued it would take us time to grow and fill the fiscal gap that separation from the UK exposes and - of course - to achieve that growth we'd need more powers. When asked how this growth will be achieved their supporters suggest a series of tax cuts (reduce Air Passenger Duty, reduce VAT on tourism, targeted tax cuts to SMEs) at the same time as arguing to increase public expenditure because they are "anti-austerity". That these measures would inevitably mean an acceleration in the rate of increase in debt at least in the short term is simply brushed over. So the SNP - who spent the indyref complaining that the UK's debt mountain is ruinously high and a sign of Westminster's economic incompetence - now argue to increase the rate of debt growth? It doesn't matter. How likely is it that these tax cuts would produce sufficient economic growth to off-set the tax losses? It's hard to say, but if this was such a "slam-dunk" economic strategy you might think the Tories (hardly shy of cutting taxes) would be all over it. "If Scotland moved from the rates of growth it has experienced in the past to instead match the levels of growth of small European countries, the benefits for people in Scotland in terms of prosperity and employment would be significant. As an illustration, had growth in Scotland matched these other independent nations between 1977 and 2007, GDP per head would now be 3.8 per cent higher, equivalent to an additional £900 per head"
So the SNP themselves have suggested that 3.8% higher growth over a 30 year period is a realistic growth dividend to expect from independence. Unfortunately, to close the £8bn deficit gap Scotland would require 16% higher growth than the rest of the UK. So that would take about 120 years then. During which time we would be funding the higher deficit how exactly? So the fact that the SNP's claims that we could grow our way out of the black-hole caused by FFA are - on their own terms - hopelessly optimistic? It doesn't matter. When the SNP manifesto was published the IFS (and any vaguely informed commentator who read the manifesto) noted that "the SNP's anti-austerity rhetoric does not reflect its plans". In fact The SNP's manifesto simply matched Labour's proposed tax increases and (according to the IFS) effectively matched their spending plans too. When the question of Independence was raised during the election Nicola Sturgeon put on her baffled face and - adopting the tone normally reserved for explaining things to a three year-old - told us that voting for the SNP wasn't a vote for Independence, it was a vote to give us a stronger voice at Westminster. That their manifesto includes a commitment to Full Fiscal Responsibility and that their written constitution commits them to pursuing Scottish Independence is not something we're meant to concern ourselves with. So the fact that the SNP will use their voice at Westminster to pursue FFA and independence at any cost? It doesn't matter. I've clearly been missing the point because the Scottish electorate have shown none of these things matter. I've made the mistake of thinking that voters realise it's not enough to just want social justice, you have to be able to afford it. I've made the mistake of thinking that voters would see through a party saying "we're anti-austerity" if they couldn't back that up with economically coherent policies. I've made the mistake of thinking that the economic deceit attempted during the Yes campaign would be remembered and punished by the electorate. It turns out that all that's required is to say "we hate the Tories", "they're as bad as the Tories" and "we're anti-austerity". But. Look where we've ended up. Scotland is now represented at Westminster by a homogenous mass of grievance seeking, Tory hating SNP MP's who's declared aim in life is to make your life as difficult as possible. They also want Full Fiscal Autonomy - at least they said they did and to refuse it now would make them look exceptionally silly. Giving Scotland Full Fiscal Autonomy means you can justify enforcing English Votes for English Laws (EVEL) which immediately boosts your effective working majority. You might need to sweeten the pill with a transitional phasing out of Barnett but as Barnett goes you gain £8bn or so to spend in the rest of the UK. Sure, you'll have to work out some stuff about fiscal constraints and borrowing limits to protect Sterling - but to all intents and purposes you can rid yourself of those troublesome jocks whilst claiming you've kept the Union together. The fact that this would lead to even deeper public spending cuts in Scotland than we'd endure as an integral part of the UK? That surely matters. This post concerns itself with the second of these publications rather then the former. However I would say that growth strategy publication is a generic collection of good wishes such as investing in infrastructure where it has a positive value, encouraging exports and innovation as well as paying more in welfare. That’s what anyone in industry would call a “fairy dust solution” as it simply states policies that sound wonderful but actually have as much chance of failure as success. However let me be clear: if there are obvious self funding policies that could be pursued that will help the UK or Scotland then I’m all for them, but who wouldn't be? 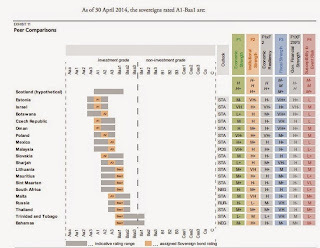 Unfortunately the N56 growth report doesn't contain any such free and obvious policies. But let’s turn to the Fiscal Autonomy paper. Full Financial (not Fiscal) Responsibility is (or at least used to be) the Scottish Government’s position as set out here. The Scottish Government don’t like to be reminded of this as it was produced by them in 2011 when they had a very different view of the Scottish public finances. However the N56 "Fiscal Autonomy" is not "full" - it differs from DevoMax or the Scottish Government’s proposals in two very important ways. Firstly the report assumes that fiscal transfers (pooling and sharing) will continue under the arrangement. This doesn't explicitly mean Barnett but it’s as close to a dog whistle as you are going to get. The idea that Scotland becomes fiscally independent from the UK but they receive fiscal transfers from the UK when it ends up below some needs based formula is de facto a continuation of our current pooling and sharing arrangements with different accountancy treatment. Also note the second paragraph about the principles to be agreed on how the proposal would work. This effectively says that the UK as a whole would need to agree on levels of spending, tax levels, benefits etc. In other words the Scottish Government would not be free to do whatever it wants, so neither “Full” nor “Autonomous” in any meaningful sense of either term. This proposal is actually a good idea in my view, indeed I’ve been in favour of such an accountancy change whilst keeping something akin to Barnett as proposed by the Welsh Assembly (although that will still leave Scotland worse off than Barnett). However let’s be clear this is not Full Fiscal Autonomy or DevoMax - it’s Smith with the transparency of GERS put on a statutory basis. Secondly, and quite outrageously, the N56 proposal flies in the face of the Scottish Government’s proposal for borrowing powers by arguing that borrowing should be granted to the Scottish Government but the UK should be the guarantor. This proposal means that the Scottish Government would have the right to borrow at UK government interest rates despite having a higher credit risk (see Moodys analysis below) and have their borrowing guaranteed by the UK taxpayer. You have to question what sane British Chancellor would accede to such a request. Allow the Scottish Government to borrow as it requires putting potential strain on the UK currency and UK interest rates on the understanding that the UK government would bail out the Scottish Government if they got into hot water? That means that the Scottish Government will expect an explicit credit guarantee from the UK, effectively having its borrowing subsidised. Again that is neither “Full” or “Autonomous”. If the Scottish Government wants borrowing powers it would need to either match the UK deficit (something that would cost us dearly as Kevin Hague demonstrates e.g here > The Great Escape) or it would have to borrow on the open market in its own name without a UK credit guarantee (as the Scottish Government proposed in the Full Financial Responsibility model). The consequences of this would be a sharp increase in Scottish borrowing costs as this would have to include servicing of its historic population share of UK debt at the higher Scottish interest rates. This brings me to probably the most intellectually insulting part of the N56 paper, on historic debt. 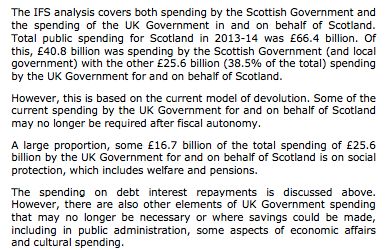 N56 shamelessly attempt to argue that Scotland should not take a population share of UK debt liabilities. This is based on a strange assumption that debt seems to start in 1980. But let’s accept the "the world started in 1980" claim for the purposes of this argument. The authors then attempt to propose that had Scotland held on to their surplus from the 1980s it would not have any debt. 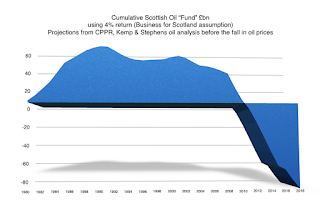 However I’ve calculated the effect of reinvesting the GERS surplus at 4% (a Business for Scotland assumption) to project the size of an oil fund. This shows that the effect of higher public spending in Scotland negate any effect of a "start the clock in 1980" surplus. But let’s deal with the start in 1980 debt dodge. You have to ask the question why start there? Why not 15 years ago for example where GERS shows that on a per head basis Scotland has only had three years where it had a lower deficit or better surplus than the UK. My own view is that you should start in 1888. That was the year that the Goschen formula started, which was the forerunner to Barnett. 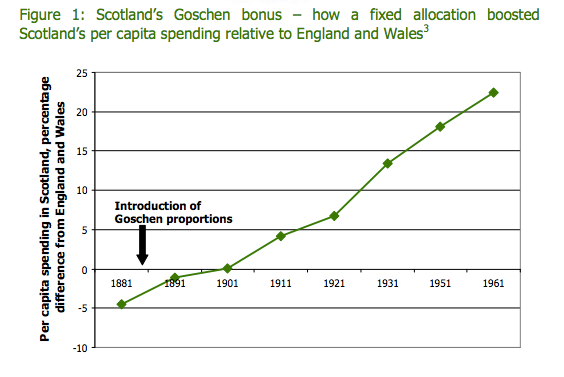 It guaranteed a level of public spending for Scotland which turned out to be far greater than its population share. Something that the the Taxpayers Alliance have been at pains to point out. 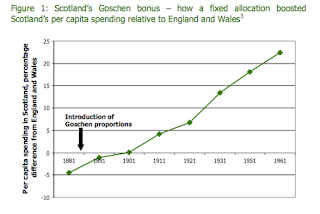 On that basis from 1888 up to the advent of North Sea oil Scotland contributed a population share on taxation but received a higher than population share of public spending. It therefore received a subsidy from the UK, again which was reasonable due to the wider dispersal of the Scottish population. On this basis a population share of the current debt is an entirely realistic arrangement and if offered on independence or real Full Fiscal Autonomy Scotland should grab it with both hands. 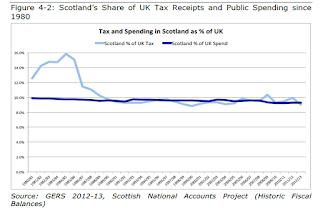 N56 then follow the debt doge with another social media dog whistle: apparently the UK is actually hiding spending and GERS does not accurately reflect the position Scotland under Full Fiscal Autonomy or independence. Again let’s start with the bleeding obvious: GERS is produced by the Scottish Government. To argue that GERS is disguising the real position of the Scottish public finances would be to imply that the Scottish Government are involved in a conspiracy against themselves! The first implication is that Scotland “only” receives £40.8bn in public spending and not the £66.4bn as allocated by GERS. Social media is full of graphics showing this without the remaining paragraphs and it’s quite clear that N56 has written this to allow this to be pulled out of context. Unfortunately what follows is rather important! 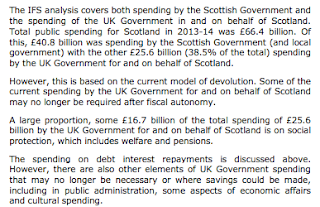 The other £25bn is almost entirely made up of £22.3bn welfare (which I expect no one is proposing that the Scottish Government cuts) and £3bn debt servicing (which I’ve argued is entirely reasonable). This then leaves the hidden spending as little more than a rounding error - and yet N56 seem to imply that there are elements of saving which could be made here on culture (BBC?) and the old chestnut of public administration. Given the numbers no consultant worth their salt would put this section into a serious report. I can only conclude that it has deliberately been designed to be taken out of context and plastered all over social media. That leads to my rather depressing conclusion about this report. It potentially contained some interesting ideas such as the kernel of a new approach to devolution where Scotland accounts for all of its taxation, and annual flows of transfers between Scotland and the UK are openly recognised within a new needs based formula. However the authors have clearly sought to produce a report for quick headlines and social media. The attacks on the IFS are there to provide comfort to anyone who is unsettled by the conclusions of their analysis on DevoMax. However the N56 criticism does stand up under any reasonable analysis. The debt dodge is designed to try to underline a myth put out by the SNP that Scotland doesn't need to take on a population share of debt - it does. Finally the entire paper is designed to be digitally waved about by anyone posting "Full Fiscal Autonomy can work for Scotland". Unfortunately the proposals outlined are neither “Full” or “Autonomous” - they are a continuation of the best parts of the UK. In other words the dirty little secret behind this report is another pro-SNP organisation has quietly concluded that DevoMax or independence is not something that Scotland should contemplate. I wonder how many SNP supporters will tweet or post that? I'm just back from one of my regular business trips to China. These trips always provide a refreshing sense of perspective on the political and economic debates we have in the UK. Based on my experiences on this trip I'm keen to write about democracy and state control of media. I have a draft blog written about how even the structure of the Chinese language impacts the way we should think about our business and social interactions with Chinese business partners, colleagues and friends. But these blog posts will have to wait, because today I feel compelled to focus on one topic: economic growth. I return home to read of a predicted Scottish landslide for the SNP at next week's General election. If this happens (and it seems clear it will) this will be the greatest escape since ... well most of them didn't escape in The Great Escape but I'm too jet-lagged to think of an alternative analogy. Let's just say it will be a great escape. Since the referendum the publication of two sets of Scottish national accounts ("GERS") and the focus on the economic realities of Full Fiscal Autonomy (FFA) should really have nailed the SNP's economic nonsense once and for all. I make no apologies for repeating this graph of the Scottish Government's own GERS data because it powerfully illustrates this point. Without oil we consistently run a long-term onshore deficit gap to the rest of the UK of about £9bn. We are currently shielded from that by pooling and sharing with the rest of the UK - Scotland does not "suffer" this deficit gap currently. 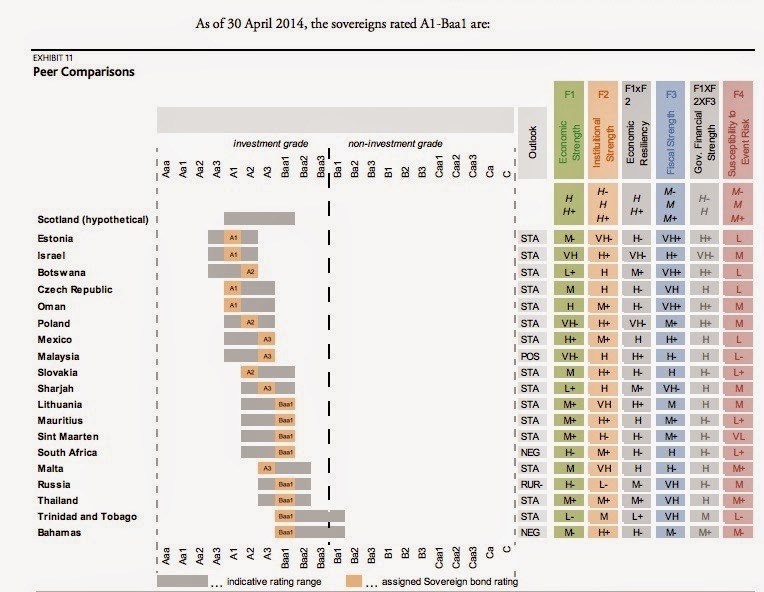 As an aside: some people react to this graph and say it's "just a snapshot". Below I have removed the most recent two years' data and highlighted the "snapshot" 5 years that were used for the Independence White paper. The Yes campaign used this period to justify their "we're independently fiscally as strong as rUK" rhetoric, long after more recent data became available. Now *that's* what I would call taking a misleading snapshot. To point out - as many of us did - that the figures actually showed how exposed Scotland's economy was to volatile oil income was dismissed as "talking Scotland down" or "suggesting oil is not an asset". Infuriating. So might oil come to our rescue? This seems highly unlikely - not because the oil price will never recover but because their is an underlying decline in North Sea profitability due to rising extraction costs. 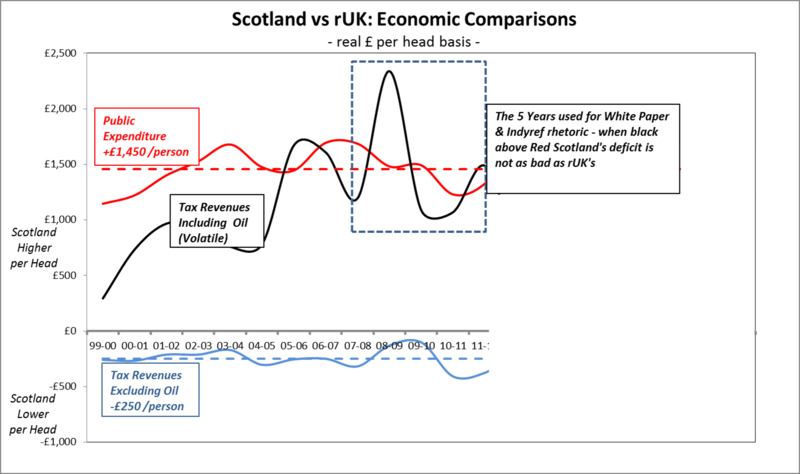 It's profit that get's taxed - so the North Sea tax yield has been deteriorating independently of the oil price decline. 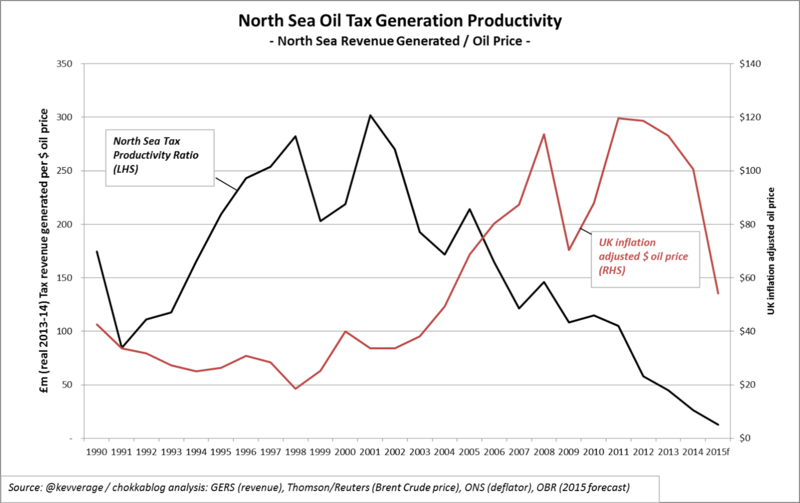 Few people seem to understand this graph but I'll repeat it anyway - the black line shows the actual historic amount of North Sea tax generated for every $ of oil price. The line declining shows the declining tax yield. Contrast that with the red line showing the oil price and you should see my point. It's quite possible therefore that North Sea oil revenues are in terminal decline. At the very least we are seeing a stark illustration of the fact that they cannot be relied upon as the basis for an independent Scottish economy. North Sea oil really does have to be considered as "just a bonus". Faced with this harsh reality the SNP can no longer hope to deny the scale of the onshore deficit gap between us and the rest of the UK. So back to this onshore (or "underlying") deficit gap. It's self evident that this gap is caused far more by higher spending on public services than by lower revenue generation. Closing the gap by cutting public spending is the obvious easy fix (about 14% cuts across the board is all it would take) but hardly a vote winner so certainly not something the SNP would admit to contemplating. Raising tax rates wouldn't be a popular option either so the SNP are left grasping at the remaining straw left to them - they'll deliver "unprecedented" economic growth. When asked quite how this will be delivered they reel off a series of tax cuts - cutting APD, reducing VAT on tourism and unspecified "targeted tax cuts to SME's". In the short-term at least this would of course reduce the tax take and exacerbate the deficit problem but this is simply glossed over. We're told we need to take a longer term view, look at the big picture, show some ambition and believe we'll grow our way out of this. Let's put aside for a moment that there is little to suggest that the raft of tax cuts proposed would drive enough economic growth to offset their revenue reducing impact. Let's ignore the fact that if this strategy would work it would be as appropriate to the UK as a whole as it is to Scotland. Let's run with the theory that the main Westminster parties are simply too stupid to realise that this political elixir is available to them. Instead let's just ask three questions. How much economic growth would we need to close this deficit gap? How long would it take take to achieve that growth? What would we do in the meantime? The "how much" question is easy to answer - we'd need to grow our onshore tax revenues by 16% over and above the rest of the UK to close the gap. The SNP say they would cut taxes to achieve this growth which means our tax take as a percentage of GDP would decline. This means of course that we would need to see even higher than 16% relative GDP growth. So the illustration they chose to demonstrate the sort of difference we could expect to see from independence was 3.8% higher GDP growth over a 30 year period. At that rate of relative economic growth it would take us about 120 years to close the gap. I think it's reasonable to conclude that the SNP's claims that growth alone will address the onshore deficit gap fails this "sanity check" rather spectacularly. So as we come to the third question: what would we do in the meantime? There are limits to how far we can go with debt - I think I might have once heard some Nationalists suggesting the amount of debt we have now is too much - so the answer is extremely simple. We'd have to dramatically reduce public spending. The SNP campaign to scrap Trident but not to dramatically reduce the defence budget, they talk of "unfair cost allocations" without actually pointing to any material examples - and in fact they talk of increasing public spending (alongside reducing business taxes). The SNP position is transparently, demonstrably, economically nonsensical - and yet a large proportion of the Scottish electorate appear to accept it. The SNP know what they are doing of course. Tell big simple lies and keep repeating them, offer the people a bogey-man to blame, sell the hope and ignore the reality. It is cynical, calculated political deceit. What makes it worse is that the people who will suffer most if the SNP succeed are those to whom their messages appeal most; the worst off in our society. It appears the scale of the SNP's deception may only be realised by the Scottish people when it's too late to do anything about it. Of course by then the SNP aim to have broken up the BBC and to have their own state-controlled media in place. Having just emerged from a week behind the Great Firewall of China, I have some perspective on the potential for politicians to exert influence over the masses through media control - but that is a topic for another day.